Lancaster Sound (Inuktitut "Tallurutiup Imanga") is a body of water in the Qikiqtaaluk Region, Nunavut, Canada. 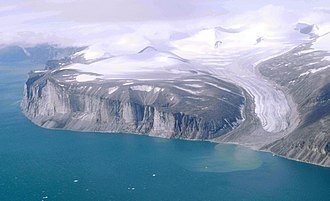 It is located between Devon Island and Baffin Island, forming the eastern entrance to the Parry Channel and the Northwest Passage. 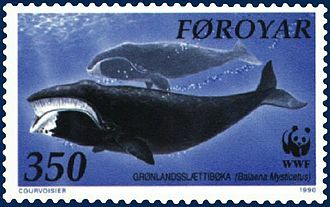 East of the sound lies Baffin Bay; to the west lies Viscount Melville Sound. Further west a traveller would enter the M'Clure Strait before heading into the Arctic Ocean. Lancaster Sound was named in 1616 by explorer William Baffin for Sir James Lancaster, one of the three main financial supporters of his exploratory expeditions. 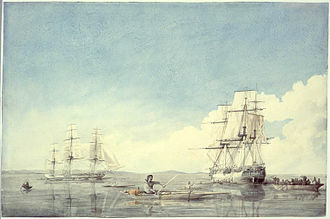 The abortive expedition by the British explorer John Ross in 1818 ended when he saw what he believed were mountains blocking the end of Lancaster Sound. In 1819 William Edward Parry got through it and went as far west as Melville Island. The sound was thoroughly explored during an extensive aerial mapping program of Northern Canada by the Canadian Government which took from the 1930s until the late 1950s to complete. Coincidentally, the type of aircraft that was used to complete the mapping program was the Avro Lancaster, a World War II heavy bomber which had been converted for mapping. The Inuit and their ancestors have relied for thousands of years on the Sound's abundant natural wealth for food, clothing and shelter. Today, residents of the three Nunavut communities of Pond Inlet, Arctic Bay, and Resolute continue this tradition, depending on its waters for their economic and cultural well being. Ice cover, both land-fast ice and pack ice, is common for nine months of the year. A shore lead system ensures there are ice-free water areas. 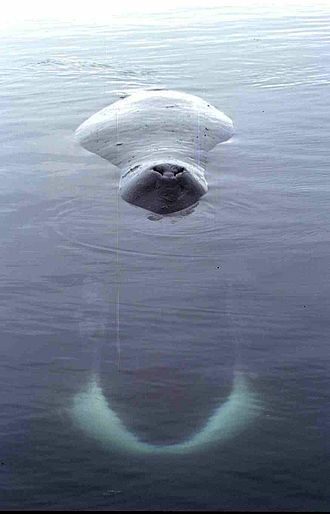 Wildlife is rich and varied, with an immense amount of Arctic cod (30,000 tons worth) known to exist there. The Arctic cod is also part of the diet for many of the birds in Lancaster Sound and marine mammals. Many narwhal, beluga, bowhead whale (an endangered species), ringed, bearded and harp seals, walrus, polar bears, thick-billed murres, black-legged kittiwakes, northern fulmars, black guillemots, Arctic terns, ivory gulls and snow geese all occupy the area. In 1968, exploratory permits were granted for 14 million acres of Canada's Arctic waters, including Lancaster Sound. In 1974, Norlands Petroleum Ltd was given approval-in-principle to drill an exploratory well in the middle of Lancaster Sound. Community opposition lead to the creation of an Environmental Assessment Review Panel that recommended in 1978 that Norlands proposal not be allowed until they could explain how exploratory drilling was compatible with current and future uses in Lancaster Sound. This area was not yet represented in the Canadian National Marine Conservation Areas systems, even though an attempt to do so at the request of local Inuit was made in 1987. A preliminary Minerals and Energy Resource Assessment to create a National Marine Park was completed in 1989. On December 8, 2009, Canadian Environment Minister, Jim Prentice announced a $5 million feasibility study for a new National Marine Conservation Area (NMCA) in Lancaster Sound. 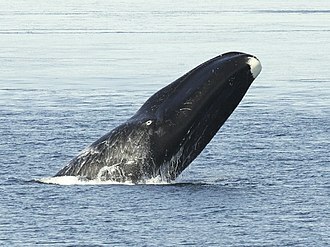 A National Marine Conservation Area designation precluded oil and gas development, and so questions arose when the Nunavut Impact Review Board approved a Natural Resources Canada (NRCAN) Geological Survey of Canada proposal to perform seismic testing for oil within Lancaster and Jones Sound in August and September, 2010. The new seismic tests were not part of the Mineral and Energy Resource Assessment (MERA) process necessary in establishing new parks. In June 2010, communities and groups came out against seismic testing in Lancaster and Jones Sound. In late June, planned seismic tests were apparently scaled back. But then in late July NRCAN announced that plans for seismic testing were proceeding despite the unanimous opposition of Inuit communities and supporting organizations. 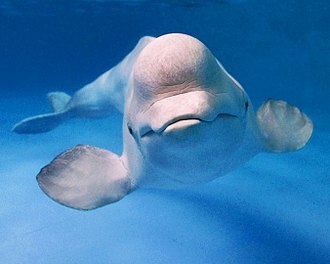 In a major ruling on August 8, 2010, a Nunavut court sided with the Inuit and stopped the planned seismic testing citing the risks to marine animals and cultural heritage. The federal Conservative government announced on December 6, 2010 that it will establish the boundaries of a new marine park in Lancaster Sound. In 2012, the Qikiqtani Inuit Association (QIA) issued a report on Lancaster Sound for North Baffin communities entitled: "Tallurutiup Tariunga Inulik: Inuit Participation in Determining the Future of Lancaster Sound". The report has two stated purposes; to provide Nunavut Land Claims Beneficiaries with an introduction to the proposed Lancaster Sound National Marine Conservation Area (NMCA), and, to inform Parks Canada, the Government of Nunavut and those interested of Inuit perspectives on marine conservation. This report explains what an NMCA is, the history surrounding interests in Lancaster Sound, the importance of where boundaries are suggested, and discussion on the realities of Inuit cooperative management in Nunavut. "This report has been titled, Tallurutiup Tariunga Inulik, which means 'Lancaster Sound has people' and also 'Lancaster Sound has Inuit.' It is from the perspective of a homeland that QIA approaches discussions related to this great region." In June 2016, the park gained the potential to expand into an area recommended by QIA when Shell relinquished adjacent oil leases after a coalition of environmental groups argued that the leases had expired. In August 2017, the federal government, the Territory of Nunavut and the Qikiqtani Inuit Association announced an agreement on the final boundary protecting a 109,000 sq. km area, making it the largest marine conservation area in Canada. The final negotiation of an Inuit Impact Benefit Agreement is expected to be completed by the spring of 2019. ^ a b Sevunts, Levon (August 14, 2017). "Ottawa and Inuit agree on boundaries for Arctic marine conservation area". RCI - Radio Canada International. Retrieved September 22, 2017. ^ a b Smith, D.R. ; Gowan, R.J.; McComb, M. (March 1989). "Geology and Resource Potential of a Proposed National Marine Park Lancaster Sound" (PDF). Arctic Institute of North America Publications. Retrieved October 6, 2017. ^ Zimonjic, Peter (December 8, 2009). "Prentice hints at new national park". Canoe.com. Retrieved October 6, 2017. ^ Boswell, Randy (April 8, 2010). "Ottawa to hunt for oil in Nunavut's Lancaster Sound". Nunatsiaq Online. Retrieved October 6, 2010. ^ Delaney, Joan (June 3, 2010). "Inuit Up in Arms over Proposed Seismic Testing". Epoch Times. Retrieved October 6, 2017. ^ Zarate, Gabriel (June 6, 2010). "Arctic Bay opposes seismic testing in Lancaster Sound". NunatsiaqOnline. Retrieved October 6, 2017. ^ "Seismic test plan for Lancaster Sound unchanged". CBC News. July 22, 2010. Retrieved October 6, 2017. ^ VanderKlippe, Nathan (August 8, 2010). 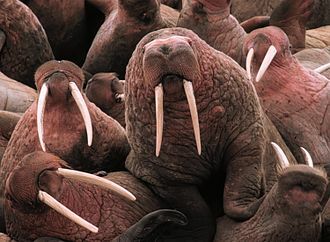 "Nunavut judge blocks seismic testing in Lancaster Sound". The Globe and Mail. Retrieved October 6, 2010. ^ Galloway, Gloria (December 6, 2010). 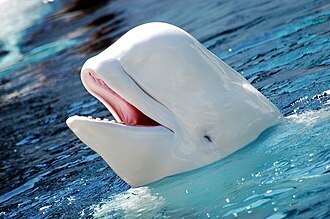 "Ottawa sets up Arctic marine park". The Globe and Mail. Retrieved October 6, 2017. ^ "Lancaster Sound". Qikiqtani Inuit Association. Archived from the original on December 22, 2014. Retrieved October 6, 2017. ^ "Towards a Marine Conservation Area". Qikiqtani Inuit Association. March 6, 2012. Retrieved October 6, 2017. ^ Ducharme, Steve (June 8, 2016). "Shell donates Lancaster Sound oil-gas leases to Nunavut marine park". NunatsiaqOnline. Retrieved October 6, 2017. ^ Frizzell, Sara (August 15, 2017). "Boundaries set for Lancaster Sound, Nunavut, Canada's largest area of protected ocean". CBC News. Retrieved September 23, 2017. Lancaster Sound on the Parks Canada website. Lancaster Sound Campaign on the Oceans North Canada website. The black-legged kittiwake is a seabird species in the gull family Laridae. This species was first described by Linnaeus in his Systema naturae in 1758 as Larus tridactylus, the English name is derived from its call, a shrill kittee-wa-aaake, kitte-wa-aaake. The genus name Rissa is from the Icelandic name Rita for this bird, the adult is 37–41 cm in length with a wingspan of 91–105 cm and a body mass of 305–525 g. It has a head and body, grey back, grey wings tipped solid black, black legs. Occasional individuals have pinky-grey to reddish legs, inviting confusion with red-legged kittiwake, in winter, this species acquires a dark grey smudge behind the eye and a grey hind-neck collar. It is a breeding bird around the north Pacific and north Atlantic oceans, found most commonly in North America. It breeds in colonies on cliffs and is very noisy on the breeding ground. One to two spotted eggs are laid in the nest lined with moss or seaweed. The downy young of kittiwakes are white, since they have no need of camouflage from predators, the old fishermans name of tarrock for juvenile kittiwakes is still occasionally used. Shell Canada Limited is the subsidiary of Anglo-Dutch Royal Dutch Shell and one of Canadas largest integrated oil companies. After a global reorganization by the European parent, Shells North American operations are controlled by Shell Energy North America, Shell Energy North Americas Canadian operational unit, Shell Canada, maintains a regional corporate office in Calgary, Alberta. Shell Canada maintains an office in Toronto, ON. Shell Canadas shares were originally traded on the Toronto Stock Exchange. The company was 78% owned by Royal Dutch Shell which in 2006 launched an $8. 7-billion takeover of the 22% of Shell Canada that it didnt own. In March 2007 the shareholders of Shell Canada Ltd. accepted a $45.00 per share cash offer from Royal Dutch Shell Plc. This acquisition was driven by the desire of the parent company to take total control of its Canadian divisions unconventional resources. The move was approved by the independent members of the Board of Directors. In 2003 Royal Dutch Shell had appointed a British executive, and former Chairman of Shell in the UK, Clive Mather, as president, as a consequence of the stock acquisition by Royal Dutch Shell, all Shell Canada executives holding stock options benefitted. Arctic Bay is an Inuit hamlet located in the northern part of the Borden Peninsula on Baffin Island in the Qikiqtaaluk Region of Nunavut, Canada. Arctic Bay is located in the Eastern Time Zone although it is close to the time zone boundary. The predominant languages are Inuktitut and English, at the 2016 census the population had increased by 5. 5% from the 2011 census. Arctic Bay is notable for being the birthplace of the former Premier of Nunavut Eva Aariak, the Arctic Bay area has been occupied for nearly 5000 years by Inuit migrating from the west. In 1872, a European whaling ship, the Arctic, captained by Willie Adams, passed through and it has the lowest tidal range in Canada. The Inuktitut name for Arctic Bay is Ikpiarjuk which means the pocket in English and this name describes the high hills that surround the almost landlocked bay. To the southeast, the flat-topped King George V Mountain dominates the landscape of the hamlet, the community is served by annual supply sealift, and by Arctic Bay Airport. There is a road connecting it to Nanisivik, a mining community just inland that is now closed. Residents had hoped to boost their housing and public facilities with buildings relocated from Nanisivik, however, a church was relocated from Nanisivik to Arctic Bay in April 2007. Nanisivik was officially closed in 2006, currently all that remains are two small houses, the rest of the community was demolished and stored underground. On 10 August 2007, Prime Minister Stephen Harper announced the creation of Nanisivik Naval Facility, construction began in August 2014 and the facility is planned to open in 2018. Arctic Bay is host to multiple events and institutions. The Army Cadets meet three times a week and this is a program under the purvey of the Ministry of National Defence. Youth aged 12 and up are welcome to join and take part in a variety of activities, the cadets regularly practice marksmanship and do a variety of outdoor activities including hiking, camping and the biathlon. For adults, there are sports teams and activities that meet regularly at the gym attached to the school. Pond Inlet is a small, predominantly Inuit community in the Qikiqtaaluk Region of Nunavut, and is located in northern Baffin Island. At the 2016 census the population was 1,617, an increase of 4. 4% from the 2011 census Pond Inlet was named in 1818 by explorer John Ross for John Pond, an English astronomer. Tununiq Sauniq Cooperative Limited, most often referred to simply as the Co-op, operates a local hotel and its economy is largely service based with government as the largest employer. Small businesses that serve the community and art work though are found, the local co-operative, Tununiq Sauniq Co-op, a member of Arctic Co-operatives Limited, is one of the largest co-ops in Nunavut. It serves the community by managing contracts and delivering goods and services to the citizens of Pond Inlet. Some of the services T. S. Co-op provides are, school bus services, First Air services, Qilaut Heavy Equipment Rentals and services, Sauniq Hotel, Construction contracts, cable Services, a grocery and department store, Yamaha Snowmobile and ATV repair shop, and others. The economy is expected to once the Mary River Iron Ore Mine is in full operation. The mine site is approximately 160 km west south-west of the community, as a tourist destination, Pond Inlet is considered one of Canadas Jewels of the North. It is one of the most picturesque communities with mountain ranges viewable from all directions, icebergs are most often accessible from the community within walking distance or a short snowmobile ride in winter. Pond Inlet boasts a nearby floe edge, several glaciers, explorable ice caves. Barren-ground caribou, ringed seal and polar bears are just some of the wildlife that can be encountered while traveling out on the land. Nunavut boasts one of Canadas newest national parks named after the glaciers that can be viewed north of the community on Bylot Island, Pond Inlet is most readily accessible by airplane through a connection in Iqaluit, Nunavuts capital to Pond Inlet Airport. The ocean is ice free for as long as three and a half months when tourist cruise ships visit and goods can be transported to the community by sealift cargo carrying ships. Peter Eric James Jim Prentice PC QC was a Canadian politician who served as the 16th Premier of Alberta from 2014 to 2015. In the 2004 federal election he was elected to the Canadian House of Commons as a candidate of the Conservative Party of Canada. He was re-elected in the 2006 federal election and appointed to the cabinet as Minister of Indian Affairs and Northern Development and Federal Interlocutor for Métis and Non-Status Indians. Prentice was appointed Minister of Industry on August 14,2007, on November 4,2010, Prentice announced his resignation from cabinet and as MP for Calgary Centre-North. All three stood as candidates in by-elections scheduled for October 27,2014, and all three were elected with Prentice becoming the MLA for Calgary-Foothills. After introducing his first budget in 2015, Prentice declared a provincial election on May 5,2015. On October 13,2016, Prentice and three others were killed when the aircraft in which they were travelling crashed shortly after taking off from Kelowna, the flight was en route from Kelowna to Springbank Airport, just outside Calgary. Prentice was born to a large, blue-collar family in South Porcupine, near Timmins, the family moved to Alberta in 1969. He was the son of Wilma Lyle Marea and Eric Prentice and his uncle Dean Prentice played in the NHL for more than 20 years. 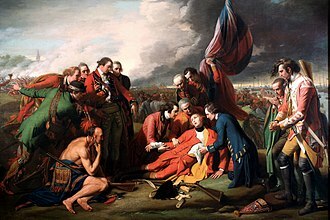 Prentice was educated at the University of Alberta and Dalhousie University and he paid for his tuition by working as a coal miner in the summer months for seven years. As a lawyer, he served as a Law Commissioner of the Indian Claims Commission of Canada, in his personal life, Prentice served for seven years on the Board of Directors at the Calgary Winter Club, including stints as President and Chairman. He was a member and volunteer leader in the Grace Presbyterian Church. Prentice and his wife Karen have three daughters and two grandchildren and he was a member of the Trilateral Commission, a non-partisan organization that aims to increase cooperation within the developed world. In this capacity, Prentice was one of 20 Canadian members, Prentice joined the Progressive Conservative Party of Canada in 1976, and was active in Tory circles ever since. 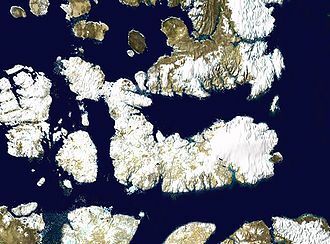 Baffin Bay, located between Baffin Island and the southwest coast of Greenland, is a marginal sea of the North Atlantic Ocean. 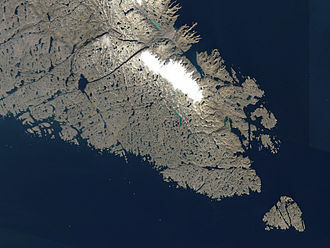 It is connected to the Atlantic via Davis Strait and the Labrador Sea, the narrower Nares Strait connects Baffin Bay with the Arctic Ocean. The bay is not navigable most of the year because of the ice cover and high density of floating ice, however, a polynya of about 80,000 km2, known as the North Water, opens in summer on the north near Smith Sound. Most of the life of the bay is concentrated near that region. The International Hydrographic Organization defines the limits of Baffin Bay as follows, a line from Cape Sheridan, Grant Land to Cape Bryant, Greenland. The parallel of 70° North between Greenland and Baffin Land, the Eastern limits of the North-West Passages. The area of the bay has been inhabited since c. 500 BC, around AD1200, the initial Dorset settlers were replaced by the Thule peoples. 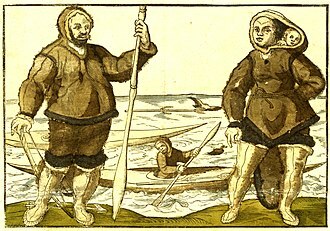 Recent excavations suggest that the Norse colonization of the Americas reached the shores of Baffin Bay sometime between the 10th and 14th centuries, the English explorer John Davis was the first recorded European to enter the bay, arriving in 1585. In 1612, a group of English merchants formed the Company of Merchants of London and their governor Thomas Smythe organized five expeditions to explore the northern coasts of Canada in search of a maritime passage to the Far East. 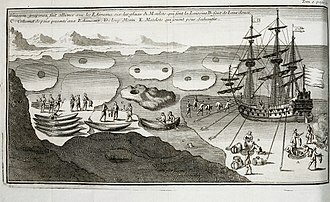 Henry Hudson and Thomas Buttons explored Hudson Bay, William Gibbons Labrador, and Robert Bylot Hudson Strait, aboard the Discovery, Baffin charted the area and named Lancaster and Jones Sounds after members of his company. By the completion of his 1616 voyage, Baffin held out no hope of an ice-free passage, over time, his account came to be doubted until it was confirmed by John Rosss 1818 voyage. More advanced scientific studies followed in 1928, in the 1930s and after World War II by Danish, there are a few Inuit settlements on the Canadian coast of the bay, including Arctic Bay, Pond Inlet and Clyde River. Those settlements are accessed and supplied by air and annual sealifts, in 1975, a town was built at Nanisivik to support lead and zinc production at the Nanisivik Mine—the first Canadian mine in the Arctic. The snow goose, consisting of both a white phase and blue phase, is a North American species of goose commonly collectively referred to as light geese. Its name derives from the white plumage. The genus of bird is disputed. The scientific name is from the Latin anser and caerulescens, derived from caeruleus and they fly as far south as Texas and Mexico during winter, and return to nest on the Arctic tundra each spring. It is a vagrant to Europe, but a frequent escape from collections. Snow geese are visitors to the British Isles where they are seen regularly among flocks of barnacle, there is a feral population in Scotland from which many vagrant birds in Britain seem to derive. In Central America, vagrants are frequently encountered during winter, the snow goose has two color plumage morphs, white or gray/blue, thus the common description as snows and blues. White-morph birds are white except for black wing tips, but blue-morph geese have bluish-grey plumage replacing the white except on the head, the immature blue phase is drab or slate-gray with little to no white on the head, neck, or belly. Both snow and blue phases have rose-red feet and legs, and pink bills with black tomia, the colors are not as bright on the feet and bill of immature birds. The head can be stained rusty-brown from minerals in the soil where they feed and they are very vocal and can often be heard from more than a mile away. White- and blue-morph birds interbreed and the offspring may be of either morph and these two colors of geese were once thought to be separate species, since they interbreed and are found together throughout their ranges, they are now considered two color phases of the same species. The color phases are genetically controlled, the dark phase results from a single dominant gene and the white phase is homozygous recessive. When choosing a mate, young birds will most often select a mate that resembles their parents coloring, if the birds were hatched into a mixed pair, they will mate with either color phase. 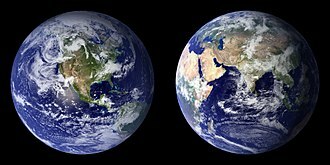 The species is divided into two subspecies on the basis of size and geography, size overlap has caused some to question the division. Northern Canada, colloquially the North, is the vast northernmost region of Canada variously defined by geography and politics. Politically, the term refers to three territories of Canada, Northwest Territories, and Nunavut, the Far North may refer to the Canadian Arctic, the portion of Canada north of the Arctic Circle and lies east of Alaska and west of Greenland. This area covers about 39 percent of Canadas total land area, for some purposes, Northern Canada may include Northern Quebec and Northern Labrador. These reckonings somewhat depend on the concept of nordicity, a measure of so-called northernness that other Arctic territories share. Canada is the northernmost country in the Americas and roughly 80% of its 35 million inhabitants are concentrated along its border with the United States. Combined with the fact that all of the country experiences severely cold winters along with short and relatively cool summers. Due to the concentration of its population along the border. Southern Canada is therefore considered to be a region only when it is contrasted against or viewed from the North, as a social rather than political region, the Canadian north is often subdivided into two distinct regions based on climate, the near north and the far north. The different climates of these two regions result in different vegetation, and therefore very different economies, settlement patterns. The near north or subarctic is mostly synonymous with the Canadian boreal forest and this area has traditionally been home to the Indigenous peoples of the Subarctic, that is the First Nations, who were hunters of moose, freshwater fishers and trappers. This region was involved in the North American fur trade during its peak importance. The area was part of Ruperts Land or the North-Western Territory under the nominal control of the Hudsons Bay Company from 1670–1869. The HBCs claim was purchased by the Canadian government in 1869 and this opened the region to non-Native settlement, as well as to forestry and oil and gas drilling. Today several million people live in the north, around 15% of the Canadian total. The far north is synonymous with the north of the tree line. This area is home to the various sub-groups of the Inuit and these are people who have traditionally relied mostly on hunting marine mammals and caribou, mainly barren-ground caribou, as well as fish and migratory birds. The Arctic tern is a seabird of the tern family Sternidae. This bird has a circumpolar breeding distribution covering the Arctic and sub-Arctic regions of Europe and North America. Recent studies have shown average annual roundtrip lengths of about 70,900 km for birds nesting in Iceland and Greenland and these are by far the longest migrations known in the animal kingdom. The Arctic tern flies as well as glides through the air and it nests once every one to three years, once it has finished nesting it takes to the sky for another long southern migration. They have a length of 28–39 cm and a wingspan of 65–75 cm and they are mainly grey and white plumaged, with a red/orangish beak and feet, white forehead, a black nape and crown, and white cheeks. The grey mantle is 305 mm, and the scapulae are fringed brown, the upper wing is grey with a white leading edge, and the collar is completely white, as is the rump. The deeply forked tail is whitish, with outer webs. Arctic terns are long-lived birds, with many reaching fifteen to thirty years of age and they eat mainly fish and small marine invertebrates. The species is abundant, with a one million individuals. While the trend in the number of individuals in the species as a whole is not known, the Arctic tern was known as sea swallow describing their slender shape as they swoop over the water. The genus name Sterna is derived from Old English stearn, the specific paradisaea is from Late Latin paradisus, paradise. The Scots names picktarnie and their variants are believed to be onomatopoeic. Due to the difficulty in distinguishing the two species, all the common names are shared with the common tern. The Arctic tern has a continuous worldwide circumpolar breeding distribution, there are no recognized subspecies and it can be found in coastal regions in cooler temperate parts of North America and Eurasia during the northern summer. During the southern summer, it can be found at sea, the Arctic tern is famous for its migration, it flies from its Arctic breeding grounds to the Antarctic and back again each year, the shortest distance between these areas being 19,000 km. Nunavut is the newest and northernmost territory of Canada. The creation of Nunavut resulted in the first major change to Canadas political map since the incorporation of the province of Newfoundland, Nunavut comprises a major portion of Northern Canada, and most of the Canadian Arctic Archipelago. Its vast territory makes it the fifth-largest country subdivision in the world, the capital Iqaluit, on Baffin Island in the east, was chosen by the 1995 capital plebiscite. Other major communities include the regional centres of Rankin Inlet and Cambridge Bay and it is Canadas only geo-political region that is not connected to the rest of North America by highway. Nunavut is the largest in area and the second least populous of Canadas provinces and territories. One of the worlds most remote, sparsely settled regions, it has a population of 35,944, mostly Inuit, spread over an area of just over 1,750,000 km2, Nunavut is home to the worlds northernmost permanently inhabited place, Alert. A weather station farther down Ellesmere Island, has the lowest average temperature of any Canadian weather station. Nunavut means our land in Inuktitut, Nunavut covers 1,877,787 km2 of land and 160,935 km2 of water in Northern Canada. This makes it the fifth largest subnational entity in the world, if Nunavut were a country, it would rank 15th in area. It shares borders with Greenland and the provinces of Quebec, Ontario. Nunavuts highest point is Barbeau Peak on Ellesmere Island, the population density is 0.019 persons/km2, one of the lowest in the world. By comparison, Greenland has approximately the area and nearly twice the population. 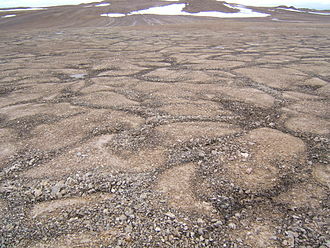 Nunavut experiences a climate in most regions, owing to its high latitude. In more southerly continental areas very cold climates can be found. The region now known as Nunavut has supported an indigenous population for approximately 4,000 years. 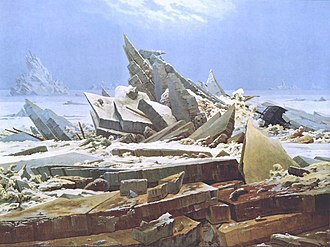 Most historians identify the coast of Baffin Island with the Helluland described in Norse sagas, the materials were collected in five seasons of excavation at Cape Tanfield. Scholars determined that these provide evidence of European traders and possibly settlers on Baffin Island and they seem to indicate prolonged contact, possibly up to 1450. The black guillemot or tystie is a medium-sized alcid. The genus name Cepphus is from Ancient Greek kepphos, a waterbird mentioned by Greek authors including Aristotle. The species name grylle was the local name for this bird in Gotland at the time of Linnaeuss visit there in 1741. 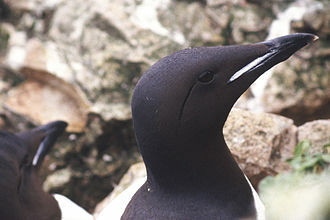 The English word guillemot is from French guillemot probably derived from Guillaume, adult birds have black bodies with a white wing patch, a thin dark bill, and red legs and feet. They show white wing linings in flight, in winter, the upperparts are pale grey and the underparts are white. The wings remain black with the white patch on the inner wing. They are 32–38 cm in length, and with a 49–58 cm wingspan, in the UK it is a fairly common breeding bird in western and northern Scotland and Ireland. In the rest of Great Britain they only breed at St. 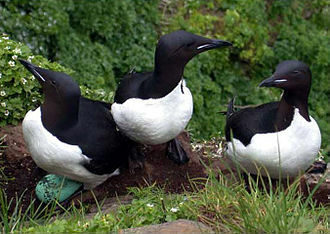 Bees Head in Cumbria, some birds breed in Alaska where their range overlaps with the pigeon guillemot. 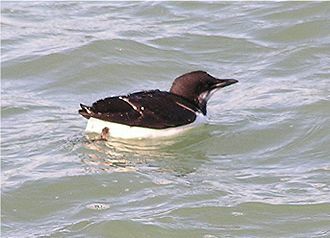 They usually lay their eggs in rocky sites near water, there are five listed subspecies of the black guillemot, C. g.
Resolute in 1997. Visible on the left is a long school building (brown). 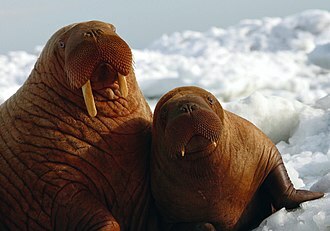 Young male Pacific walruses on Cape Pierce in Alaska. 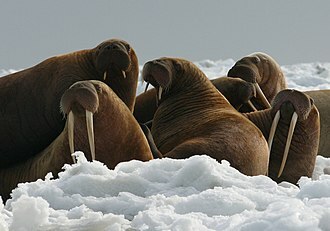 Note the variation in the curvature and orientation of the tusks and the bumpy skin (bosses), typical of males. An opponent of the proposed Bill C-61 holds up a protest sign at a public breakfast event held during the Calgary Stampede by Canadian Industry Minister Jim Prentice. Leif Erikson discovers North America, Christian Krogh (1893). skin of the ringed seal.